Website focusing on providing customers information & allowing an online ordering system for potential clients. 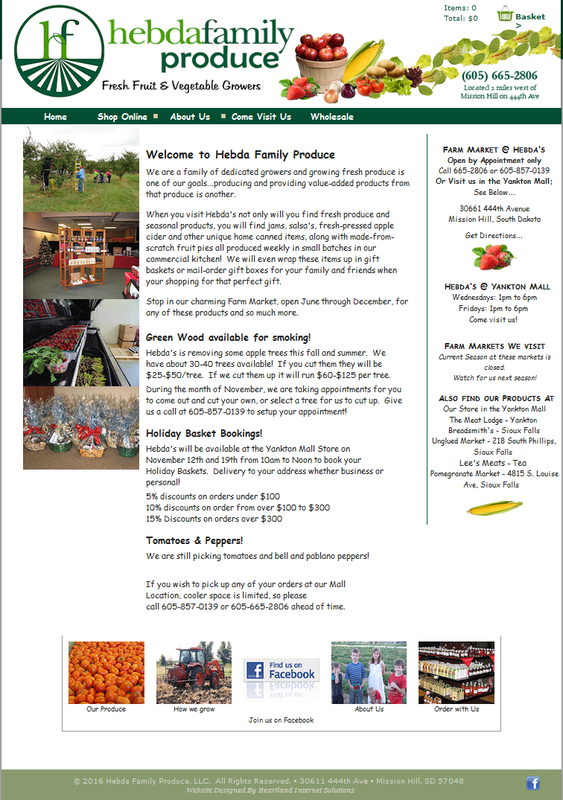 Hebda Family Produce is a website that features a custom online order system. This gives the customers a way to browse items they have for sale and send in an order request. We also are able to update their home page easily with information they send us to let their customers know what is available and what is coming up for availability. After a couple of years with us, Hebda’s felt they needed an area for their wholesalers to login to see current pricing, Heartland Internet Solutions was able to find a cost effective way to do this for them. When Hebda’s first came to us, they were know throughout the region as a prior owner’s name, so we also hold an additional domain name, garritys.com, so that customers can find them, new and old. Thank you to Hebda’s Family Produce for choosing Heartland Internet Solutions for their website needs. Simple place to find hours & locations.